This is the polish after 2 coats, topped with Poshe fast drying top coat. As you can see, it’s not 100% opaque, as you get a little bit of VNL (visible nail line) through it, though this would be solved with a third coat. I just don’t mind having a little VNL and love the color regardless. My main complaint is one that I have with all OPI polishes, and that’s the extra large brush! I have really small hands and nails, so I like the thin brushes like you get with Zoya and Essie. As you see here, the wide brush made it difficult not to get polish on my nail folds in the sides. I may have to look for a dupe of this in a brand with a brush I can stand. 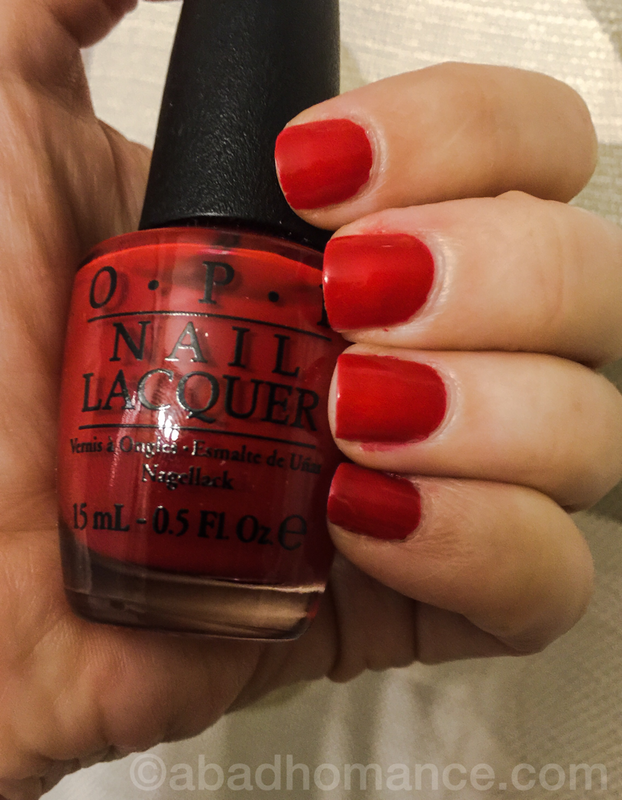 Aside from that, if you know you like OPI’s brushes, you may really love this bright, classic, true red! This entry was posted in beauty blog, beauty blogger, Nailpolish, Nails and tagged beauty blog, beauty blogger, home manicure, nail blog, nail lawuer, nail polish, natural nails, OPI, OPI polish, poshe, poshe top coat, red nail polish, short nails by Rachel. Bookmark the permalink.